Like his music or not, Gucci Mane is working harder than any other rapper in the game. In 2012, Gucci Mane released three mixtapes, in total. Three months into 2013, Gucci Mane has dropped four mixtapes and he is just getting started. 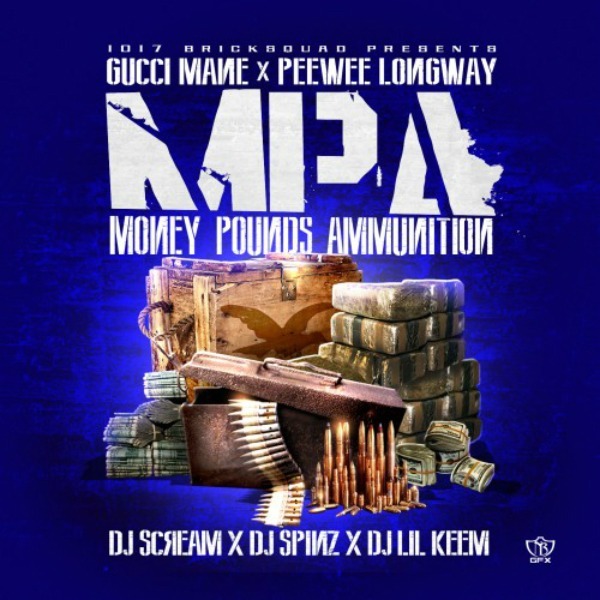 Number four comes alongside PeeWee Longway in the form of their joint project, MPA (Money, Pounds, Ammunition). Guest appearances come from Waka Flocka Flame, Young Thug, Rich Homie Quan, Dose, Young Dolph, and many more. The mixtape is hosted by DJ Scream, DJ Spinz, and DJ Lil Keem. Download MPA (Money, Pounds, Ammunition) by Gucci Mane and PeeWeeLongway here.